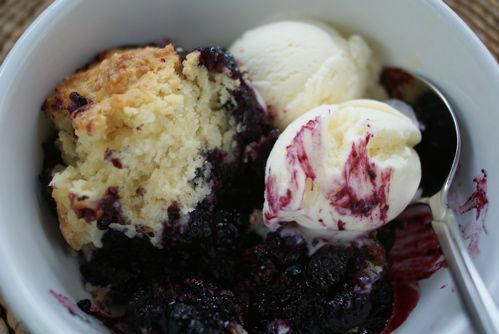 This cobbler makes quick work of berries—blackberries, blueberries, huckleberries, raspberries, and strawberries. Make use a surplus of berries in season, or use frozen berries (either from the market or ones you froze in season) since they fall apart when cooked in the cobbler anyway. Just sweeten the fruit a bit, cover with a buttermilk drop biscuit topping, and bake. Note: This recipe calls for quick-cooking tapioca as the thickener, which will leave the fruit juices clear and thickened but not gummy. Feel free to use cornstarch instead, but know that the fruit filling may look a bit cloudy. Preheat oven to 350 F. In a 2-quart casserole dish or similar baking pan, toss the berries with 3/4 cups of the sugar. Taste and add more sugar if you like a sweeter filling. Add tapioca and lemon juice and toss to combine. Set aside. In a large bowl combine flour, remaining 1/4 cup sugar, salt, and baking soda. Cut butter into small pieces and add to flour. Using your fingers, a fork, two knives, or a pastry cutter, work the butter into flour until it looks like cornmeal with some pea-sized chunks in it. Stir in buttermilk to combine. You'll have a loose batter. Drop batter by the spoonful onto the berry mixture. Depending on the size and shape of your dish, you may have spots of batter or be able to cover the entire top with batter. Bake until batter is golden brown and berry juice is bubbling along the edges, 45 to 60 minutes. Let cool at least slightly. Serve cobbler warm or at room temperature – it will be best the same day it is made but makes a delicious breakfast the next morning too!